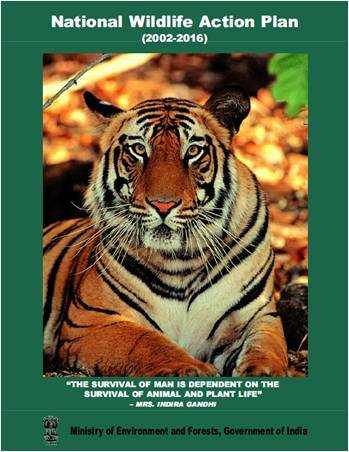 The National Wildlife Action Plan is the framework of strategy for conservation of wildlife. The first National Wildlife Action Plan of 1983 has been revised to the new Wildlife Action Plan (2002-2016). The Wildlife Protection Act, 1972 is an Act of the Parliament of India enacted for protection of plants and animal species. Before 1972, India only had five designated national parks. Among other reforms, the Act established schedules of protected plant and animal species; hunting or harvesting these species was largely outlawed. This document highlights the linkages of India’s NBAP and NBTs with CBD’s Programme of Work on Protected Areas (PoWPA) as well as with the Global Strategy for Plant Conservation (GSPC). The Addendum 2014 to NBAP 2008 reiterates India’s commitment to conservation of biodiversity as a national priority recognising its crucial linkages with the livelihoods and well-being of her people. Preparation and submission of National Reports is an unqualified obligation on all the Contracting parties to the Convention on Biological Diversity (CBD). The Fifth National Report provides an important source of information for a mid-term review of progress towards the implementation of the Strategic Plan for Biodiversity 2011-2020 and the progress towards the Aichi Biodiversity Targets. 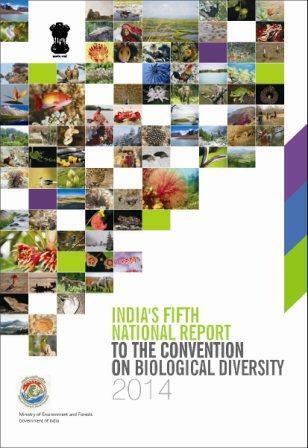 India’s Fifth National Report has been prepared following a consultative process involving a very wide range of stakeholders and paints a narrative picture of the current status of and trends in biodiversity, threats to biodiversity and implications for human well-being. It also describes the process of updating the National Biodiversity Action Plan (NBAP) and its implementation and reports on progress achieved towards meeting the Aichi Biodiversity Targets and on linkages with fulfillment of India’s commitment to the Millennium Development Goals (MDGs). Develop national strategies, plans or programmes for the conservation and sustainable use of biological diversity or adapt for this purpose existing strategies, plans or programmes that shall reflect, inter alia, the measures set out in this Convention relevant to the Contracting Party concerned. 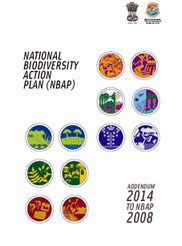 This has come to be known as the National Biodiversity Strategy and Action Plans (NBSAPs). Integrate, as far as possible and as appropriate, the conservation and sustainable use of biological diversity into relevant sectoral or cross-sectoral plans, programmes and policies. NBSAPs are the principal instruments for implementing the Convention at the national level. 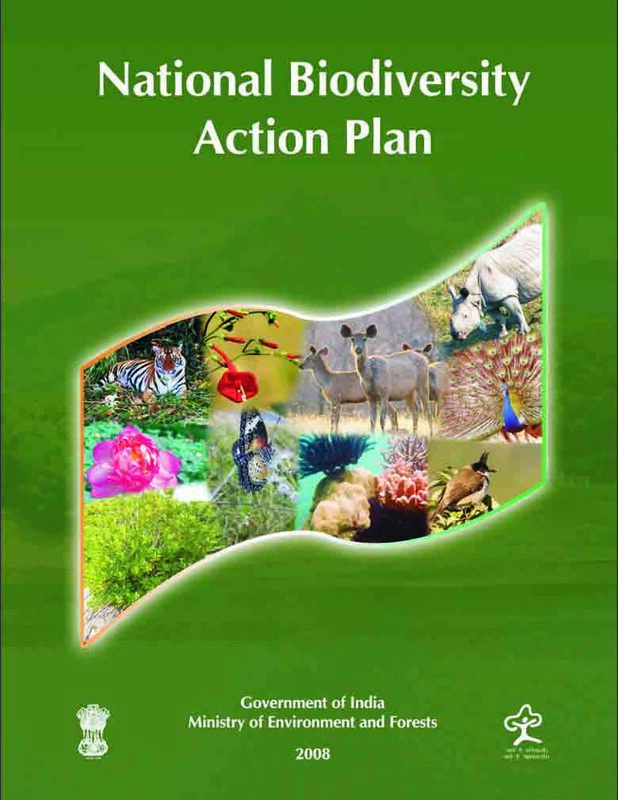 In line with the convention, India developed its own National Biodiversity Action Plan (NBAP) by updating the National Policy and macro-level Action Strategy on Biodiversity developed in 1999. India's NBAP, formulated through a comprehensive inter-ministerial process, was approved by Government of India in 2008. In the light of Strategic Plan for Biodiversity 2011-2020 and the Aichi Biodiversity Targets, NBAP is being revised currently and will be published after the approval from the Ministry. 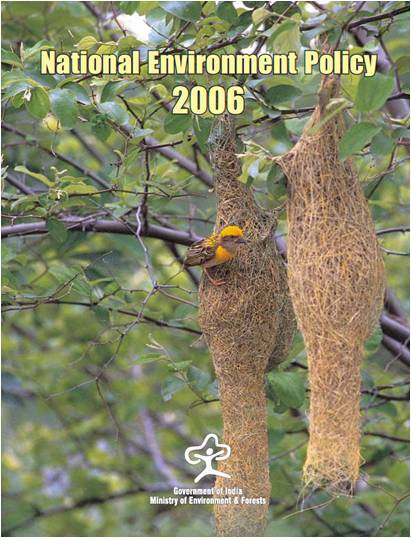 India’s National Environmental Policy (NEP) was adopted in 2006 and was built upon on the existing policies ( e.g. National Forest Policy, 1988; National Conservation Strategy and Policy Statement on Environment and Development, 1992; and the Policy Statement on Abatement of Pollution,1992; National Agriculture Policy, 2000; National Population Policy, 2000; National Water Policy, 2002 etc). The dominant theme of this policy was that while conservation of environmental resources is necessary to secure livelihoods and well-being of all, the most secure basis for conservation is to ensure that people dependent on particular resources obtain better livelihoods from the fact of conservation, than from degradation of the resource. The policy also desired to stimulate partnerships of different stakeholders, i.e. public agencies, local communities, academic and scientific institutions, the investment community, and international development partners, in harnessing their respective resources and strengths for environmental management.